Color composite image of the Subaru XMM-Newton Deep Survey Field. The red galaxy at the center of the image is the most distant galaxy, SXDF-NB1006-2. The left panels show close-ups of the most distant galaxy. The galaxy, called SXDF-NB1006-2, lies a whopping 12.91 billion light-years from Earth. Since its light has taken that long to reach us, we are seeing it as it was less than a billion years after the Big Bang created the universe. 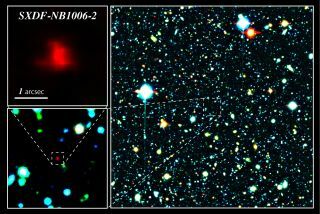 So SXDF-NB1006-2 was likely among the first galaxies ever made. Astronomers hope that by studying SXDF-NB1006-2 and other far-flung objects, they can piece together what happened in the dawn of the cosmos. The newfound is the latest contender for the oldest and farthest galaxies yet seen. Earlier this month, astronomers at the University of Arizona also found a galaxy that appeared to be nearly 13 billion light-years from Earth. Last year, another team of scientists using the Hubble Space Telescope announced the discovery of a galaxy that may be even older and farther away. That galaxy was found to be 13.2 billion light-years from Earth, but remains a "galaxy candidate" and is awaiting confirmation by follow-up studies. The Big Bang is thought to have sparked the universe about 13.7 billion years ago. At first, it was too hot and dense for objects, or even atoms, to bind together. As the baby universe expanded, it cooled, and eventually quarks bonded to form protons, which eventually linked with electrons to form neutral hydrogen atoms380,000 years after the Big Bang. This gas cooled over time, and by 200 to 500 million years after the universe's birth, clouds of neutral hydrogen condensed to form the first stars and the first galaxies. Galaxy SXDF-NB1006-2 existed around 800 million years after the Big Bang, so it offers a glimpse closer than ever to that critical time. "The day is not so far off when the mysteries of the dark ages of the Universe and the physical properties of the first galaxies will be revealed," Masanori Iye, the leader of the Thirty Meter Telescope project at the National Astronomical Observatory of Japan, said in a statement. To observe such a distant, faint object, scientists had to collect light through the telescopes over 37 hours, letting more and more light accumulate to see as deep as possible. Researchers, led by Takatoshi Shibuya of The Graduate University for Advanced Studies in Japan, counted 58,733 objects in the image, and narrowed those down to two possible candidates for extremely distant galaxies. With followup spectroscopic measurements that broke up the light into its constituent wavelengths, the astronomers identified one very faraway galaxy. SXDF-NB1006-2 replaces the previous record holder for farthest galaxy known, GN-108036, which was also found by Subaru and was just slightly closer to us. The findings will be published in the June 20, 2012, edition of the Astrophysical Journal.